The following statements request a correlation analysis and a scatter plot matrix for the variables in the data set Fish1, which was created in Example 2.6. The “Simple Statistics” table in Output 2.8.1 displays univariate descriptive statistics for analysis variables. The “Pearson Correlation Coefficients” table in Output 2.8.2 displays Pearson correlation statistics for pairs of analysis variables. The variables are highly correlated. For example, the correlation between Height and Width is 0.92632. The PLOTS=MATRIX(HISTOGRAM) option requests a scatter plot matrix for the VAR statement variables in Output 2.8.3. Note that this graphical display is requested by enabling ODS Graphics and by specifying the PLOTS= option. For more information about ODS Graphics, see Chapter 21: Statistical Graphics Using ODS in SAS/STAT User's Guide. 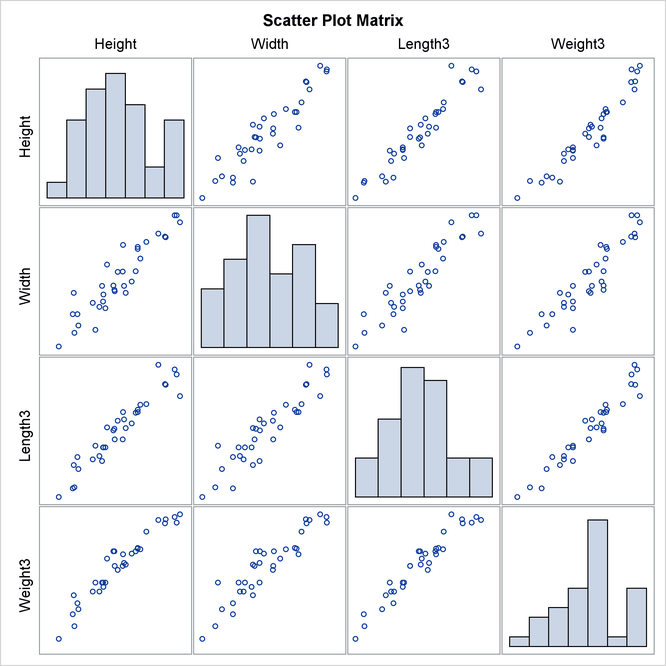 The PLOTS=SCATTER(NVAR=2) option requests a scatter plot for the first two variables in the VAR list. The ALPHA=.20 .30 suboption requests and prediction ellipses, respectively. 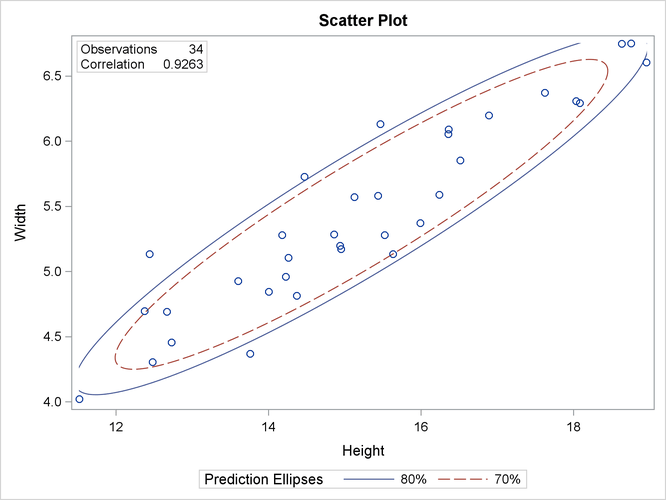 A prediction ellipse is a region for predicting a new observation from the population, assuming bivariate normality. It also approximates a region that contains a specified percentage of the population. The displayed prediction ellipse is centered at the means . For further details, see the section Confidence and Prediction Ellipses. Output 2.8.5 includes the point , which was excluded from Output 2.8.4 because the observation had a missing value for Weight3. The prediction ellipses in Output 2.8.5 also reflect the inclusion of this observation. The NVAR=2 suboption within the PLOTS= option restricts the number of plots created to the first two variables in the VAR statement, and the ELLIPSE=CONFIDENCE suboption requests confidence ellipses for the mean. The ALPHA=.05 .01 suboption requests and confidence ellipses, respectively. The confidence ellipse for the mean is centered at the means . 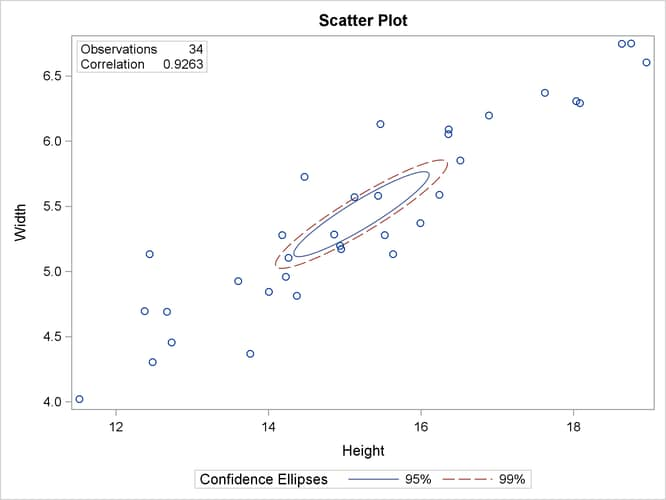 For further details, see the section Confidence and Prediction Ellipses.